BELFAST, 2015-5-12 — /Travel PR News/ — Ever fancied running down the runway at George Best Belfast City Airport? Business advisory firm Grant Thornton is inviting teams to partake in the first official runway run in Northern Ireland. 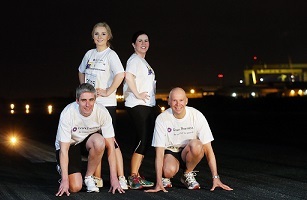 On Wednesday 24 June, under the glow of the runway lights, hundreds of runners will take-off down the runway at 11pm as the inaugural Grant Thornton Runway Run touches down at Belfast City Airport. “At Grant Thornton we look at things differently. “We wanted to create a fun sporting event that encourages friendly competition and which promotes team building among Northern Ireland’s business community. “We didn’t want a race around a local park which you can do any time – we’ve pushed the boundaries to create a unique 5k race that we believe will capture everyone’s imagination. The race is open to all businesses and organisations in Northern Ireland who are invited to enter a team of four in one or more of three categories – male, female and mixed. Prizes will be awarded in each category with team members’ finishing times combined to determine the winner. “The popularity of running has increased significantly in recent years with 5k park-runs across Northern Ireland introducing running to the masses. “The Grant Thornton Runway Run provides the ideal terrain with a fast, flat course which takes in the runway and adjacent taxi ways. “Belfast City Airport is here to serve the local community and we’re delighted to work with Grant Thornton in this first for running in Northern Ireland. “In supporting the airport’s Community Fund, local youth projects in the area will benefit and the legacy of the race will remain long after the final runner crosses the finish line”. The run will be chipped time and there will be a Grant Thornton Runway Run t-shirt and goody bag for all participants. The number of participants is restricted, and those interested are advised to register early to avoid disappointment. You can keep up to date with Grant Thornton NI on Twitter (#GTRunwayRun) and LinkedIn. This entry was posted in Airports, Festivals and Events, Travel Marketing, Travel Services, Travelers and tagged Belfast City Airport, Grant Thornton Runway Run, Michelle Hatfield, Richard Gillan. Bookmark the permalink.